The Qinghai-Tibetan Plateau is referred to as the Third Pole because it is the third largest mass of ice on the Earth, after the Arctic and Antarctic. Its glaciers provide a water source for 1.3 billion people in Asia. According to an Intergovernmental Panel on Climate Change (IPCC) assessment report, the Qinghai-Tibetan Plateau’s glaciers will recede by 80% by the 2030s, if temperatures continue to rise at the present rate. This problem is being exacerbated by overgrazing of livestock like yak and Tibetan sheep in the highland rangelands (those found more than 4,000 metres above sea level), which cover more than half of the plateau. That is why a research team from the International Centre for Tibetan Plateau Ecosystem Management (ICTPEM) founded and headed by Professor Ruijun Long at Lanzhou University in China’s Gansu Province has been working hard to help reverse these disturbing trends. Our World 2.0 recently spoke to Dr. Zhanhuan Shang from the Centre about the tragic rangeland decline in the county of Maduo in Qinghai province where desertification has hit hard: over 70% of former rangeland area is now considered desert. “The situation seems pretty desperate,” he laments. In 1970, Maduo was rated as the richest county in the whole of China. In 2009 however, Maduo’s 20,000 people are among some of the poorest in China. According to the New China News Agency, much of its population has been relocated due to severe ecological degradation, especially the lack of water. The Maduo experience is a familiar story across western China. Parts of the Yangtze River basin are desertifying as a result of rising temperatures and poor land management, and some communities near the Yellow River are forced to buy fresh water from other areas to survive. The alpine rangelands of the Qinghai-Tibetan Plateau provide essential food for their native populations and, functioning as carbon-sinks, are an ecological necessity for the world’s fight against global warming. When it comes to livelihood destruction, desperate times call for desperate measures. The Centre’s researchers have been working with the Maduo community to address this decline through a programme that aims to improve biodiversity, livestock production and human livelihoods. Shang makes the important point that, for many low emitting communities around the world, adaptation strategies are the obvious answer. Therefore, talk about mitigation strategies, so often the centrepiece of discussions in the Western media, is not as relevant for Tibetan herders. Instead, over the life cycle of the ICPTEM project, Tibetan communities in Maduo have been adapting to a new reality. The team has been assisting local livestock herders to improve the quality of their land management practices in order to revitalise both their human and natural environments. Primarily, the programme has focused on rebuilding bare alpine rangelands through implementation of payments for ecosystem services and other simple measures like improved fencing that keeps livestock in certain areas and allows other areas to flourish. Other components of the project include using excess forage to regenerate former cropping regions and the building of private plots to boost food security for the farmers. “Donors support the project because it works,” Shang says happily. In 2006, a symbolic shift took place when the World Bank also hopped on board. They and other organisations have come to realise the value of restored rangeland areas for storing CO2. In explaining the reasons for the project’s success, Shang mentioned the need to gain the trust of the local community. Shang believes that such trust can only be built up over the long term and he cites the ICTPEM team’s 10-year partnership with the communities of Maduo as an example. Supporting this philosophy, ICTPEM’s economic modelling has found that an environmentally sustainable risk management approach to land management has a significant net income effect, but only after 10 years. Another of the programme’s initiatives is the very honestly named “natural enemy industry”. The natural enemy in question is a local rodent called pika that has been thriving since the 1970s as a result of the decline of its predator, the native hawk. Ironically, hawk numbers were decimated after attempts by the local population to reduce pika populations through poisoning missed their intended target. Today, there is an extensive breeding program in place and habitat stands have been especially built for the hawks to rest upon before they attack their prey. Perhaps, the livestock themselves are another enemy within. 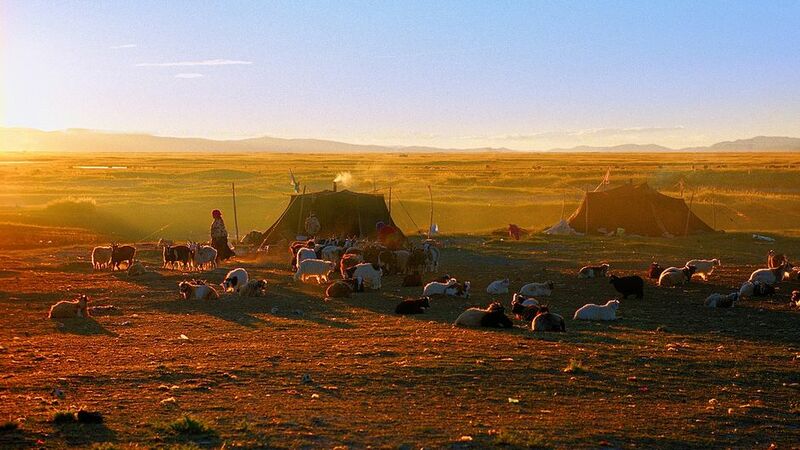 Livestock are an essential part of the cultural identify of these Tibetan communities (there are about 50 million sheep and 1.4 million yaks in the Qinghai-Tibetan Plateau in comparison to just 10 million people). Yet, in increased numbers, the animals have the potential to destroy the very land that supports this identity. Removing livestock above a certain threshold has relieved the pressure on the rangelands and reduced the amount of methane gas emitted. To supplement lost income, the communities are instead breeding chickens in the three summer months on the livestock’s winter pastures, whilst the livestock are kept on their summer pastures located in either high mountain or remote areas. High hopes for the future? Encouragingly, several other communities across the Qinghai-Tibetan Plateau are benefiting from similar projects like this one funded by the European Commission. Yet, the Maduo project’s continued existence, and the Centre’s goal to spread the project to other herders, is dependent on limited and uncertain Chinese Government and donor funding. Shang believes that the main problem is the ability of poor local governments to attract funding from sources outside of the region. In reality, in booming China, with its 1.3 billion citizens, rural Tibet cannot compete with megacities like Shanghai, one of the financial capitals of Asia. As a result, China’s growing inequality gap continues to increase. “We need this policy to keep on going. That is why I want to show the world what is happening regarding environmental issues in the Qinghai-Tibetan Plateau,” Shang says. High and Dry by Mark Notaras is licensed under a Creative Commons Attribution-NonCommercial-ShareAlike 3.0 Unported License. Wow, very impressive post. Thanks! Wow, loved it. Thanks Mark. Hi Name,The article argues that according to the IPCC the Qinghai-Tibetan Plateau’s glaciers could recede by 80% by the 2030s. It is clear that the Tibetan’s bear almost no responsibility for global warming. However, as the glaciers recede this will impact on the grasslands, which are in turn detrimentally affected by over grazing. The article addresses the question of what can be done in this context to adapt to these changes and to preserve the local livelihoods. It is hard to understand how protecting local livelihoods in the face of climate change can be seen as propaganda. The article is trying to present a positive example of how science can inform local communities and empower them to adapt to climate change.